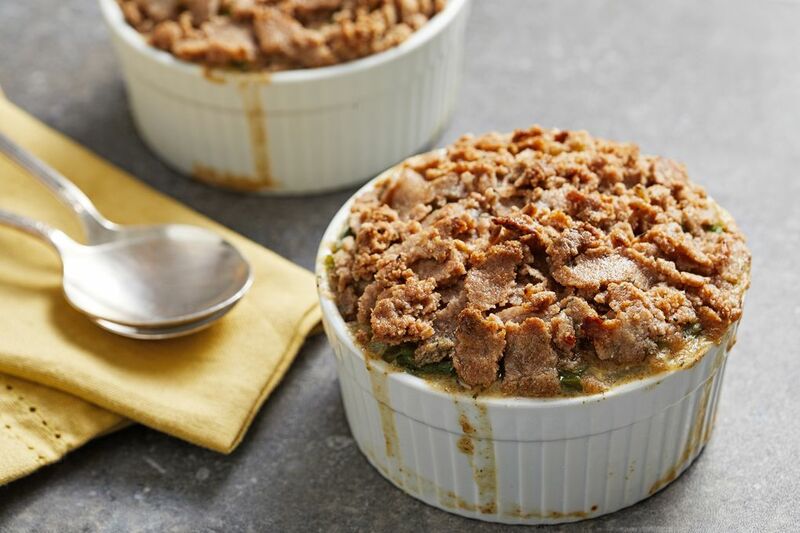 Chicken Potpies With Crumble Crust. (Photo by Tom McCorkle for The Washington Post). The best thing and the worst thing about chicken potpie could be the crust. It’s the best because that’s what turns a prosaic chicken stew into a glorious pie, rendering each bite a pastry-adorned indulgence. But from a nutritional point of view, it’s primarily the crust that makes traditional, double-crust potpie unhealthful, adding loads of refined flour and butter or shortening. This recipe solves that conundrum by rethinking the crust so it offers a tender, flaky pie experience without the downsides. The crust here is made with whole-grain pastry flour, olive oil and just a bit of butter, and it is approached almost like you would a graham cracker crust, so there is no rolling involved. First, you whisk the oil with milk, which yields an emulsified, thickened mixture. That gets poured into the flour, which has had a little butter worked into it, and the mixture is stirred with a fork until it is moistened and crumbly. Fresh thyme adds a savory, floral element. At this stage the dough, which is easily shaped, is hand-flattened and then torn into flakes. They top individual baking dishes filled with the chicken stew, so that it resembles a crumble topping. That stew, incidentally, is better for you as well, because it is made with heaps of vegetables and low-fat milk rather than cream. The result is the best of both worlds – an unexpectedly sumptuous take on chicken potpie with a fabulous flaky crust. You’ll need individual ramekins or baking dishes that can hold 1 1/2 to 2 cups each. 1. For the filling: Preheat the oven to 425 degrees. Use a little oil to grease the inside of the ramekins or baking dishes and place them on a baking sheet. Season the chicken with 1/4 teaspoon each of the salt and pepper. 2. Heat 1 tablespoon of the oil in a large, high-sided skillet over medium-high heat. Once the oil shimmers, add the chicken and cook for about 5 minutes, stirring once or twice, until it is nicely browned. Transfer the chicken to a plate. 3. Add another tablespoon of oil to the skillet, then add the onion, celery and mushrooms; cook for about 4 minutes, stirring occasionally, until the mushrooms have released their moisture and it has evaporated. Add the green beans, the garlic, the remaining 1/2 teaspoon salt and the remaining 1/4 teaspoon of pepper; cook for 1 minute more. 4. Pour in the broth; increase the heat to high. Pour the milk into a liquid measuring cup, then stir in the flour until it has dissolved. Pour the mixture into the pan; cook, stirring, until the mixture comes just to a boil. Reduce the heat to medium-low; cook for 2 minutes, stirring occasionally, the return the chicken to the pan along with the peas, parsley and thyme. Stir until evenly distributed. This is your potpie filling; divide it among the ramekins or baking dishes. 5. For the crust: Whisk together the whole-grain pastry flour and the salt in a medium bowl. Whisk the milk into the oil in a small bowl until it is well integrated. Add the butter to the flour mixture and work it in with your fingers or with a pastry cutter until the butter is the size of small pebbles. Drizzle with the oil mixture, then add the thyme. Combine with a fork until crumbly, then use your fingers to bring it together so all the flour is evenly moistened. 6. Lightly flour a work surface. Shape the dough mixture into 4 small rounds. Place them on the work surface, then use the heel of your hand to flatten each round as thin as possible. Tear flakelike pieces of the flattened dough, using one round per dish, and arrange on top of each potpie to make a rustic, crumbly topping that covers the filling. 7. Transfer the baking sheet to the oven; bake (upper rack) for about 20 minutes, or until the mixture is bubbling and the crust is golden brown. 8. Cool slightly before serving. Krieger is a registered dietitian, nutritionist and author who hosts public television’s “Ellie’s Real Good Food.” She blogs and offers a weekly newsletter at www.elliekrieger.com.